While trying to reach Arthur, an old friend of Lamont, in the Louisiana bayou, Margo is attacked by large dogs who apparently can trick you by meawing from behind the bushes. Lamont manages to scare the dogs before Margo is hurt. They finally reach Arthur's house which is pretty run-down and apparently abandoned. Arthur had a life-long problem with his voice which pushed him to retire in this remote area (since he believes everyone was making fun of it). The problem is that Arthur is also a scientist and, when our duo shows up to his doorstep, he seems to have resolved his "problem". The voice is now fixed, but what about his un-stable mind? I can't help to think about mad scientist messing with nature like the Dr Moreau or even South Park's Dr Mephisto. This last one came to mind because of the apparently useless results of some of Arthur's experiments. 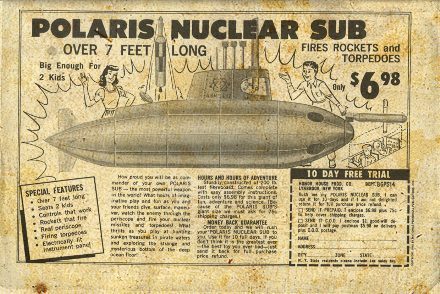 That's what happens in this beautiful episode: an insane(ly rich) hunter, Barry Vinton, has a costum-built submarine so he can destroy ships at sea and machine gun the helpless crews, just for fun (or sport, as he says). "Ah, this is the life, there's nothing like it. The sighting of fresh quarry in this periscope. 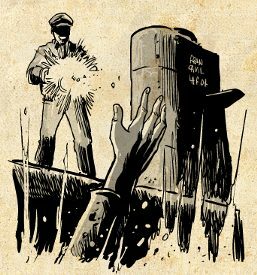 The excitement of the chase and the spine-tingling thrill as the torpedo finds its mark. And then the climax, on deck with a machine gun, shooting them down like scurrying rats. Ha ha!" 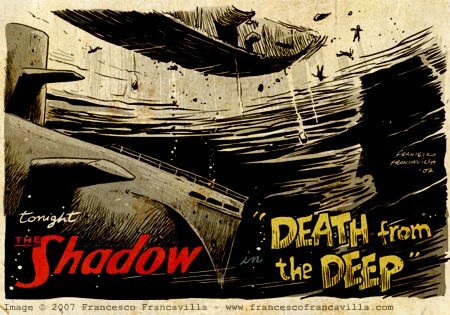 It looks like this is a mission in high seas for the Shadow. 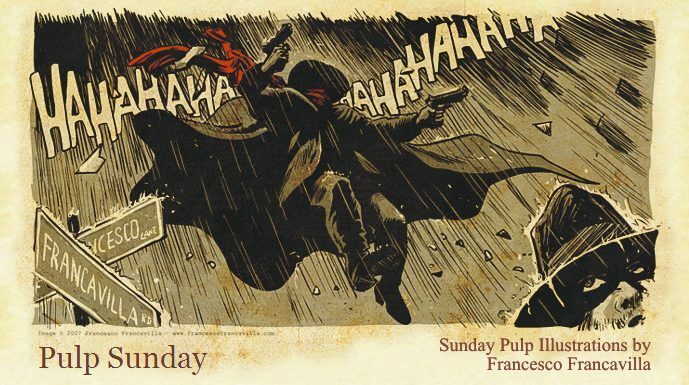 Enjoy the epsiode and have a Pulp Sunday! While visiting a cave just opened to the public, a few students fall down a pit when the rail gives way. 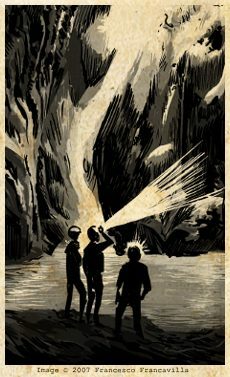 A rescue team is sent to find eventual survivors (or at least to recuperate the students' bodies) but they found nothing. 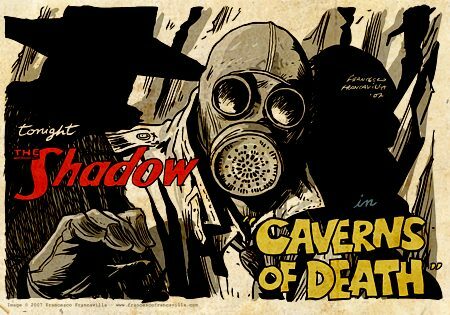 It seems a case for the Shadow! As matter of fact Lamont and Margot go down the cave to investigate and they discover a series of sinister activities in the lower levels of the caverns. I have to admit I was fascinated by the description of the villain of this episode: a man who wears a gas mask all the time so no one has ever seen his face. Pretty cool, uh? That was definitely calling for being the main subject of my illustration. 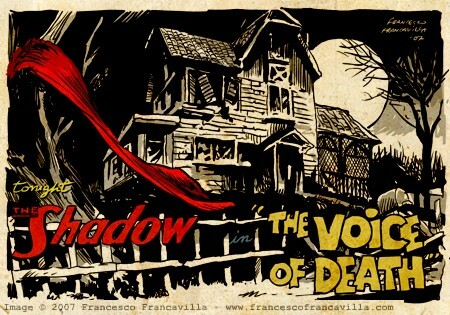 Speaking of which, if any of you wants to see a particular episode of the Shadow illustrated here, feel free to post suggestions and/or titles. 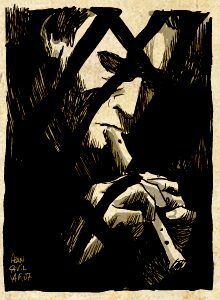 They have tried to convict him many times int he past, but he always had a "bulletproof" alibi for each murder. This time something went wrong, and there is no one who can save this murderer gangster from the deathrow. That's why he promises revenge upon those who put him to death: he will come back from grave and kill all of them. 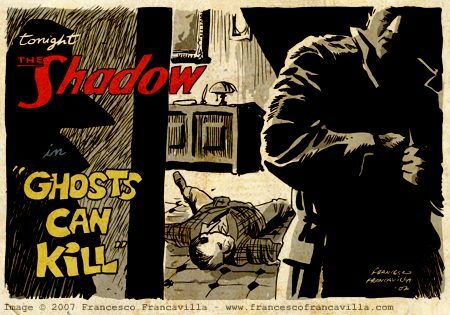 When, after the execution, the people on the list starts to get killed by the "ghost" (who announces his "apparitions" with the same music the murderer was used to play), the Shadow steps in to unveil the real killer.